Grab some popcorn, a soda – or a vodka soda – and head into a movie this weekend. Cobb Theatres, Leesburg’s newest cinema, will open July 22. This week, final touches are being smoothed out on the 68,000 square-foot cinema at the Village at Leesburg. The 12-screen theater broke ground last summer. This is the first theater for Alabama-based Cobb Theatres in Northern Virginia. The company builds its theaters with accompanying up-scale grills and a full-service bar. Tickets will be sold in the ground-floor lobby, which provides electronic and reserved-seat ticketing. 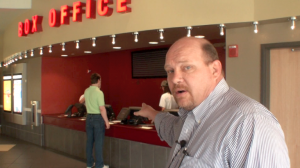 Guy Austin of Cobb Theatres gives us a tour of the cinema. Moviegoers may be just as delighted at the selection of food and drink as they will for the feature flick. A full-service bar, complete with beer, wine and liquor, sits beside a two-story window on the main level that overlooks the main thoroughfare at the Village at Leesburg. Patrons can order a drink while seated around the bar from a server or they can order a cocktail and take it to their seat inside the theater. The concession stand faces the bar in the main lobby. Instead of waiting in line, patrons are encouraged to grab food items themselves in a cafeteria-style procession, paying for items from cashiers at the end of the line. In addition to the concession stand, the grill menu selection may seem more expansive than most patrons are used to at a movie theater. “[This] entire theater is an entire break from the traditional theater,” said Guy Austin, executive director of theatre operations. Food items include Italian sausage ravioli, hand-made pizza, barbecue chicken nachos, chicken fingers, coconut shrimp and healthier fare including pita chips and hummus and frozen yogurt with fresh fruit toppings. When it comes time to settle in front of the big screen, the 12 theaters offer stadium-style seating with custom-designed, rocking seats, wall-to-wall curved high-grain screens, Real-D 3D cinema technology and D-Box seating. D-Box seating is a technology that introduces motion in the stadium seating – movement in the seats is concurrent with the action on the screen. Only a selection of the theaters offer this option. Leesburg is also home to Tally-Ho Theatre in downtown. Don Devine, of Devine Commercial Inc. in Leesburg, put the 81 year-old, two-screen cinema building up for sale with a $2.6 million ticket price, last year shortly after the announcement of Cobb Theatre’s opening this summer. The future of Leesburg’s original cinema remains unknown, as the building is still in operation has yet to be sold one year later. Cobb Theatres chose Leesburg for its “tenant mix, multiple entertainment options and outstanding consumer demographics offered by the Northern Virginia marketplace,” Jeremy P. Welman, chief operating officer of Cobb Theatres, said last year in a statement. Austin said the theater’s opening will help bring more people to the opposite side of the shopping center, which is anchored by Wegman’s grocery store. “It creates a lot more synergy,” he said.